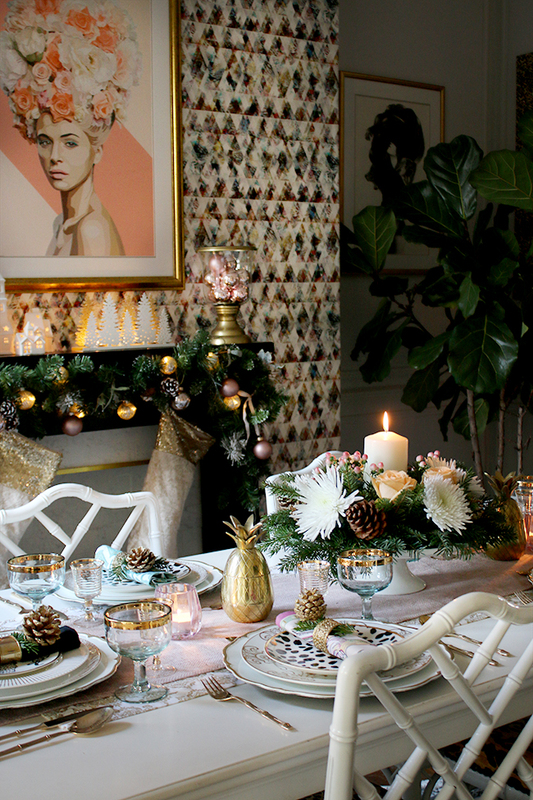 Setting the table for Christmas is probably one of my favourite activities because there’s almost no such thing as ‘too much glam’ when it comes to Christmas – okay, in my eyes anyway. It’s the one time of year when you can really go big and have fun with it. 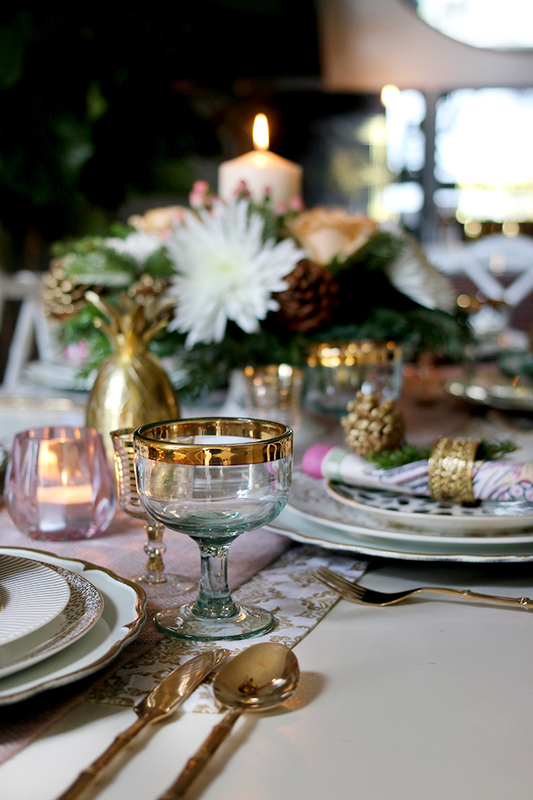 But ‘glam’ often comes with a price and when budgets are stretched at this time of year, spending money on your table setting may seem a bit too frivolous. 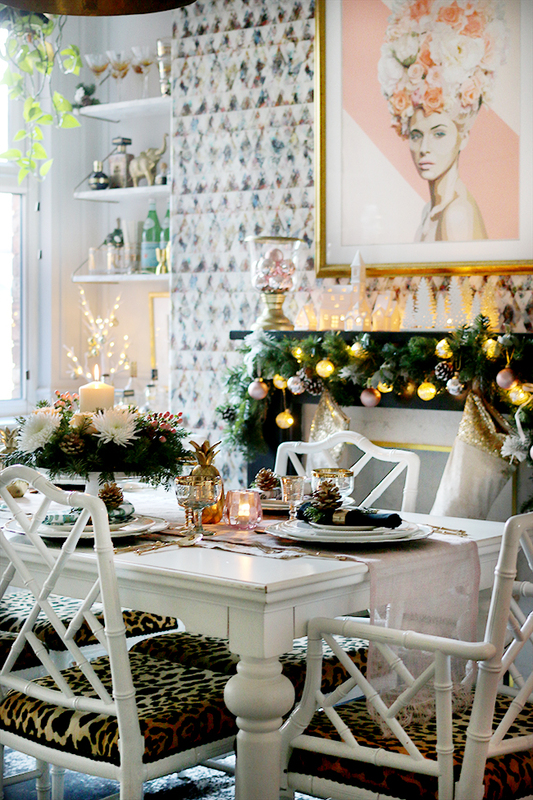 I’ve teamed up with SwiftCover once again for their #SwiftHomeHacks campaign which helps people who are on a budget with thrifty tips to make the most of their homes and today’s post will give you the most ‘bang for your buck’ when it comes to setting the table this Christmas. Even on a budget, it’s possible to achieve a high-end look! I set the table for 6 here even though we’re only serving dinner for 3 this year. While we have a big crowd during the day of all of Wayne’s family, it’s only his mum that eats Christmas dinner with us which is kind of nice. It makes it all a lot more intimate which I enjoy and we still get to enjoy the whole crew without having to cook for 10! 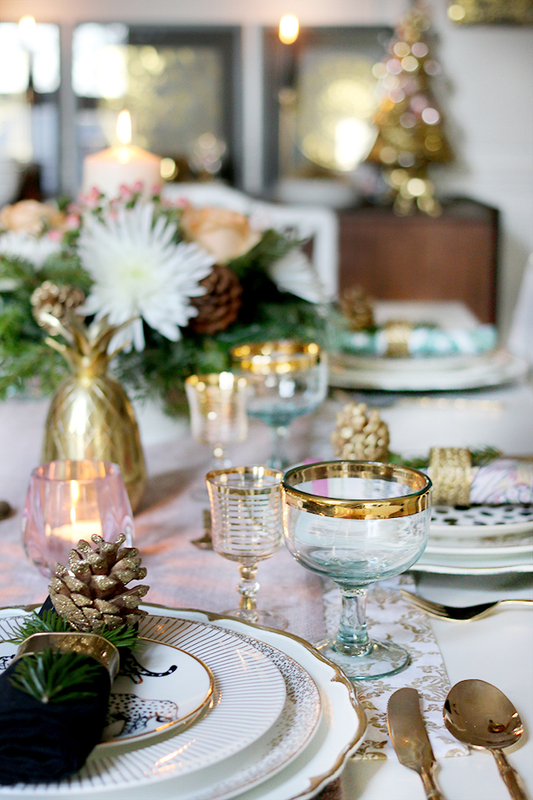 However, for the sake of sharing a full table setting, here’s what it would look like if we were hosting for more and by following my tips, you can create a gorgeous table setting for less than you might think! Here’s the thing. Every set of plates and dishes I have are only in a set of 4. If you are setting the table for a bigger crowd, there’s no reason not to mix and match your serve wear. If you stick with a limited palette, you can mix and match different sets to create an eclectic look. In fact, every place setting is slightly different on my table but you wouldn’t necessarily realise that immediately because I stick to a limited palette when I purchase my plates – white, gold and black. 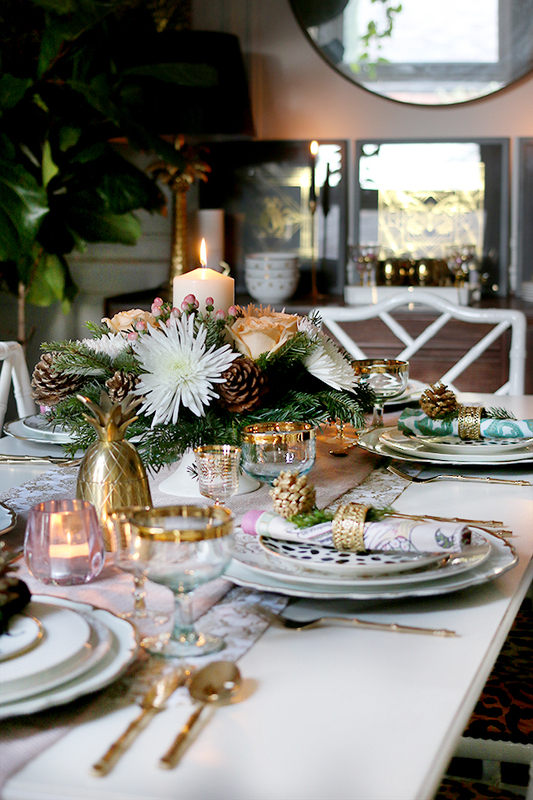 You’ll also notice I don’t necessarily go with ‘Christmas themed’ dishes which means I can use my collection over and over again, no matter what the season, simply by swapping the accessories. I have used the same 2 sets of dinner plates for years. What I have done, however, is buy inexpensive side plates (which are normally a lot cheaper) and setting them on top of the dinner plate gives the whole thing a new look. 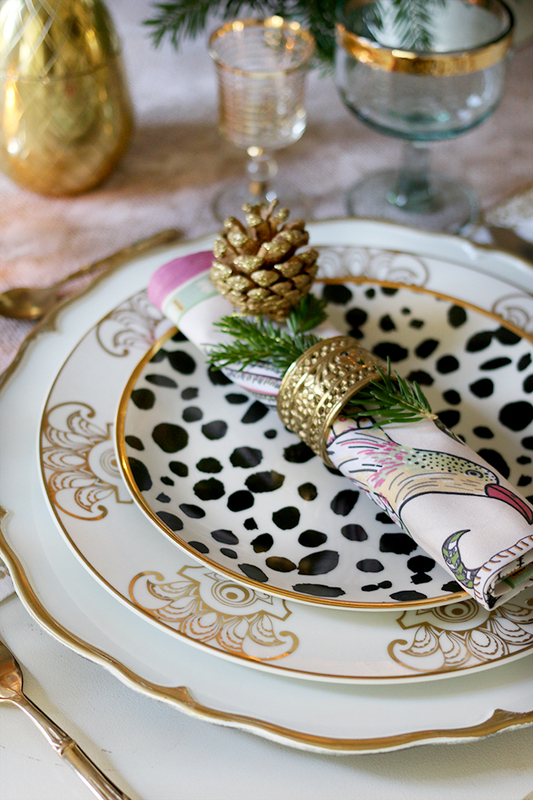 I’ve used these spotty ones and the leopard ones from H&M Home before but I just love the contrast on the dishes. In fact, H&M often have really inexpensive but beautiful side plates in all different styles and they normally don’t cost more than around £5-£7 each. Again, I have had the white and gold runner for years. I bought it in the sales that Zara Home have twice a year (20% off and free shipping!) but this year, decided to layer another runner on top to give it a more luxe look. The top runner is a pale pink linen that I purchased from West Elm for a mere £7 in their clearance section. You can also create a table runner yourself with nothing more than a long piece of inexpensive fabric and hemming tape for the edges. Having two on top of one another or a runner on top of a tablecloth creates a much more luxurious feel than just one or the other. A few inexpensive glass tea light holders will make any table sparkle and you can find them pretty much anywhere. The small pink ones I have were from B&Q of all places and were only £3 each. 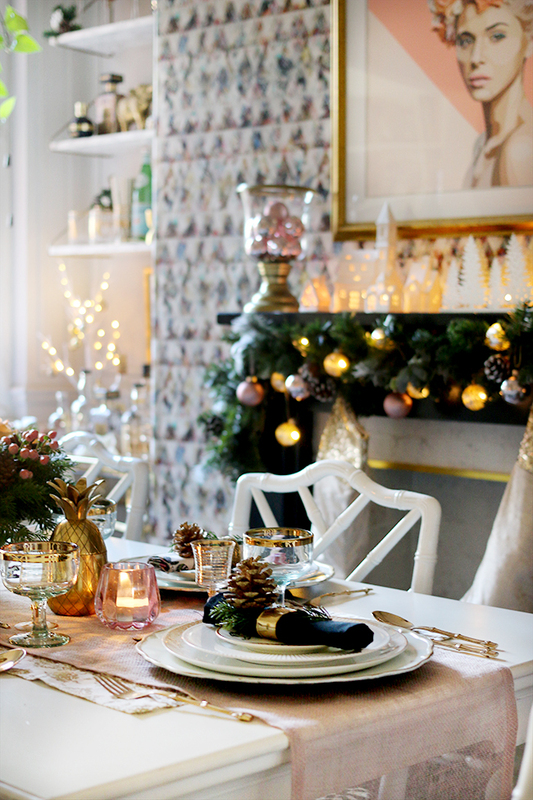 Dotting a few along the length of the table will create a cosy luxe vibe for very little outlay. You might also consider picking up a mix of vintage brass candlesticks which look beautiful at Christmas. 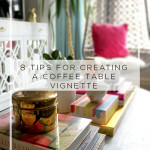 Check eBay, charity/thrift shops, car boot sales, Freecycle or Craig’s List and layer them along the length of the table. 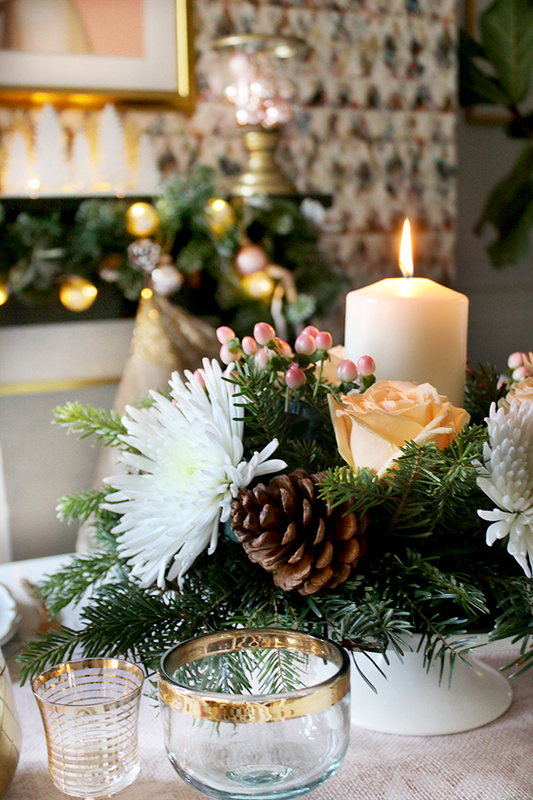 The floral centrepiece on my table was actually a DIY I created myself. I’m no floral arranger but this was far easier than I ever imagined. I’ll be sharing the tutorial with you soon but a low-level cake stand, some supermarket flowers and off cuts from the Christmas trees at my local garden centre (which were free!) plus some floral foam were all that was needed and it was much, much cheaper than purchasing it pre-made from a florist! The large coupe glasses were also purchased on sale at West Elm but I’ve had a lot of success with finding second-hand vintage glassware for cheap as well. The small sherry glasses (perfect for Christmas port or an apéritif) were purchased at a vintage fair for £15 and they are fairly common on eBay as well. I’ve also found full sets of glasses for less than £10 in my local thrift shop too. Keep an eye out for bargains – mid-century glassware is a personal favourite! 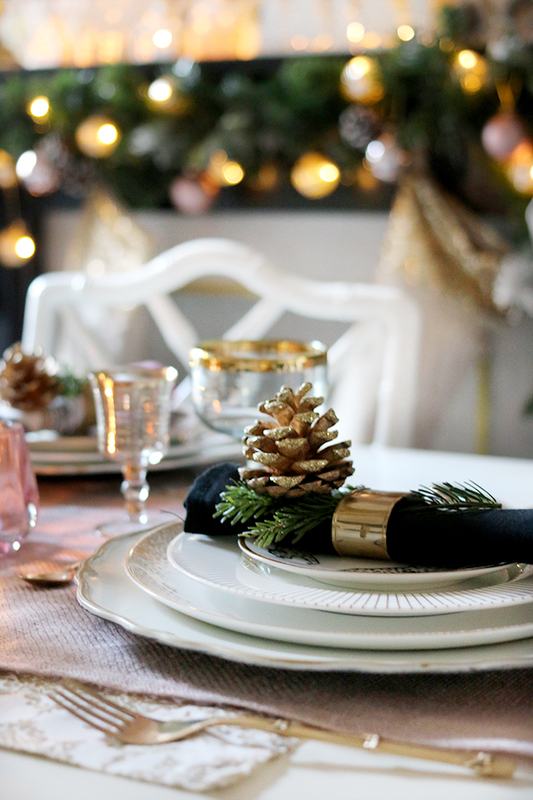 As my colour palette for my Christmas decor is all black, gold, white and pink (plus a little green in the garlands and plants), I again mixed and matched my napkins to follow that theme. I used a few of my high-end napkins from Halsted Design here and then mixed them with my cheapie Amazon black linen napkins* too. 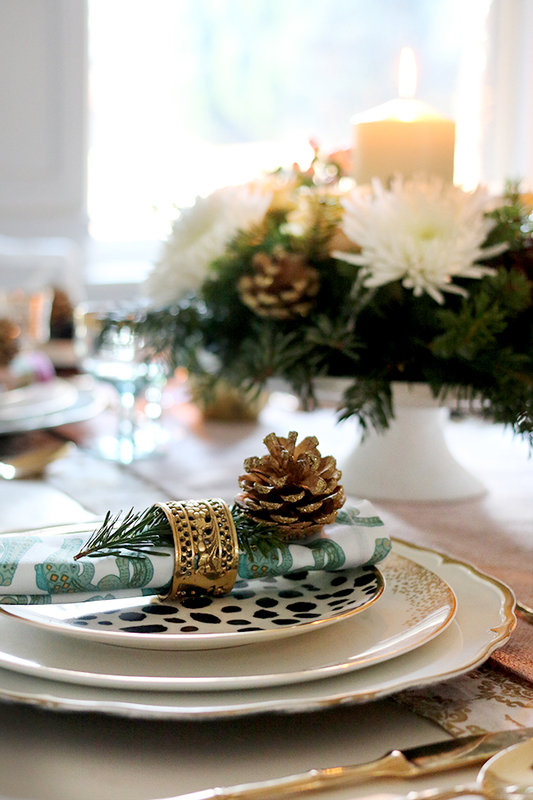 I used some pine clippings left over from my centrepiece tucked into the napkin holder plus a simple glittered pinecone to finish them off. A little greenery goes a long way on a plate setting so tucking a stem of eucalyptus or rosemary is another option that’s inexpensive but most importantly, doesn’t look it! I spoke about my bamboo style gold cutlery in this post but it cost me £25 from eBay and it’s great quality. If you do a search for ‘bamboo bronze cutlery’ on eBay, you’ll see sets pop up from time to time so keep your eye out for a bargain. You can also find some fantastically priced gold cutlery sets on the market (Argos has a 24 piece set for £23!) although the gold doesn’t last very long on these cheaper ones! So my recommendation is to go with a bronze set instead of electro-plate so that it can be polished to its sparkling original condition as soon as it starts to go a little dull. To finish off your glam table setting, I’d also recommend something on the table that’s a little bit different. 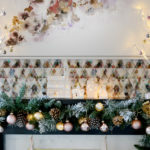 You probably know by now I like my bit of ‘weird’ – something that you wouldn’t necessarily find in a traditional Christmas setting but still adds a little wow factor and may act as a conversation starter (always good at any Christmas gathering). 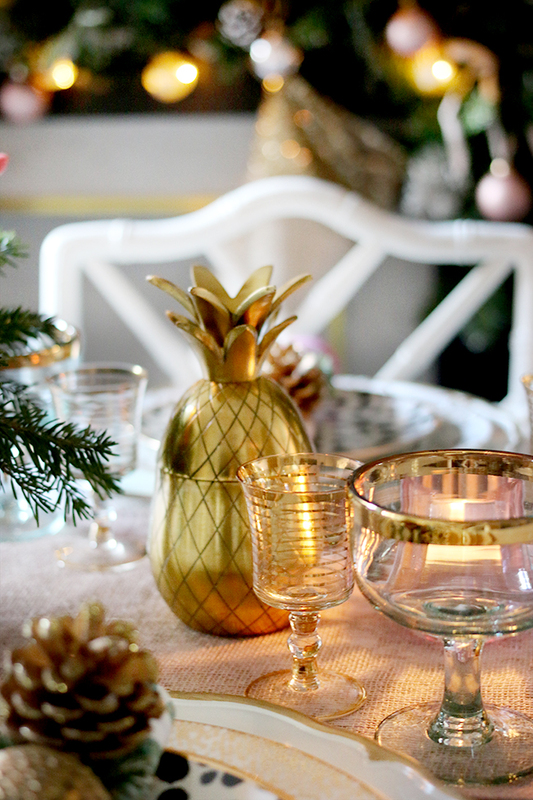 Here, I pilfered two brass pineapples from my sideboard but really, anything that picks up the theme would work well. 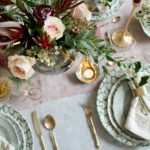 I’ve used brass elephants, brass cranes, pairs of Chinese foo dogs and small potted plants in interesting containers in past table settings – use your imagination and shop your house! 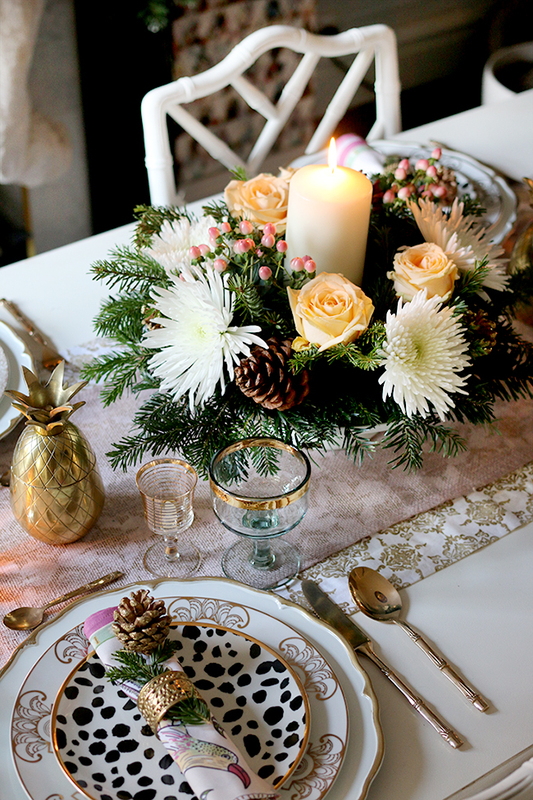 So that’s my full Christmas table setting for 2016 and hopefully, you can see how easy it is to create your own look without having to blow the budget. I will say that there isn’t a lot of room for big plates of food on the table but we always set up the food in the kitchen and bring plates to the table so that gets around that issue ;) What about you? 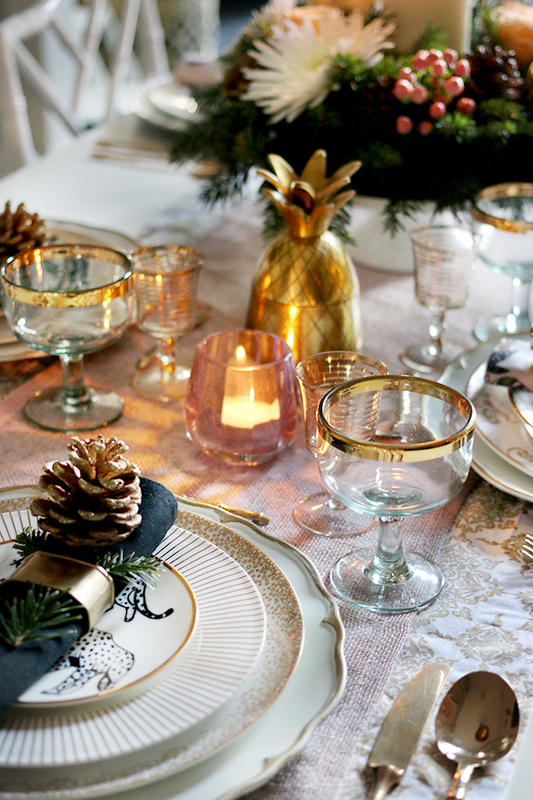 How do you set your Christmas table? Any bargain tips to share? I’d love to hear from you! Disclaimer: This post was sponsored by SwiftCover but as always, all images, words and opinions are my very own! I only work with companies I really like and think you will too! Thanks for supporting the brands that support Swoon Worthy! I always look forward to this post, and it hasn’t disappointed, you’re table’s looking beautiful. So beautiful – I love it!!! And that centerpiece is a triumph! 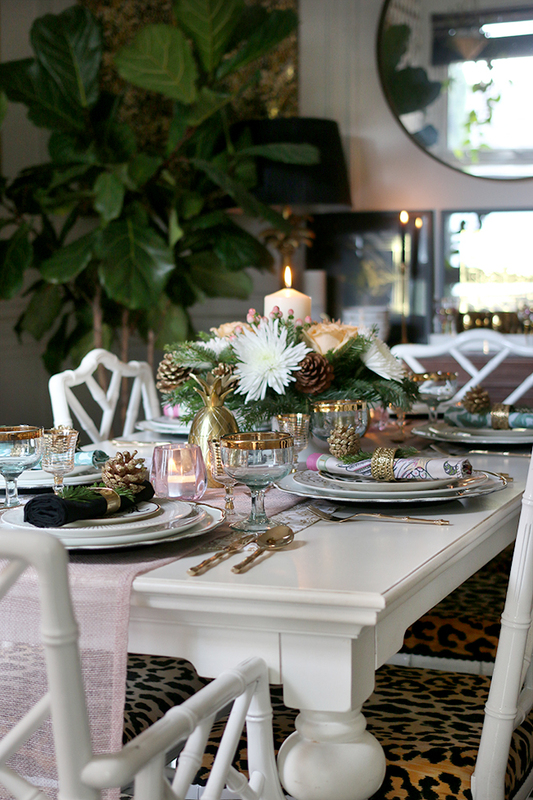 I really need to try to style a fancy table like this – I’m too lazy normally! 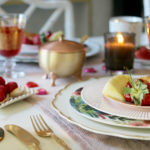 This table setting is my all time favorite. Stunning! These tips are all amazing! I’m just dying over the whole table setting! You are an absolute pro at mixing and matching and I’m definitely taking notes! I like your idea of setting up a great table but I don’t agree to your idea of burning up a candle because it can give stunning look only for hours but after that you have to place a new candle or have to miss next time. Overall, great look of your table. Merry Christmas Kimberly, thank you for all your stunning creations this year – looking forward to seeing what gorgeousness you’ve got in store for us all in 2017!